St. Luke's is a reconciling, affirming and inclusive Christian community that welcomes all people through worship, love and service just as God created them. No matter where you are on your journey of faith, our welcome knows no artificial boundaries of age, race, ethnicity, culture, gender, sexual orientation, family circumstance, economic condition, physical or mental ability or belief. We are doctors, laborers, lawyers, trades people, teachers, stay at home moms and dads, active workers and retirees, people who in the ordinary process of life we might never even meet. 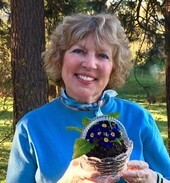 St. Luke’s has members who reside in Coeur d’Alene, Post Falls, Hayden Lake, Hayden, Athol, Rathdrum, Priest River, Dalton Gardens, Sagle, Hauser, Cataldo, Kingston, Careywood, Wallace, and Harrison. We also have some who live in Washington—Spokane, Spokane Valley, Bothell, and Veradale. And we even have some parishioners with out of state addresses--in Oregon, New Mexico, Montana, California, and Texas. We welcome all opportunities where we can interact with curious Christians from whom we can learn, people who will share with us their understanding of God’s love and how that impacts our understanding of our call to live out our Christian calling. What unites us is the love of Jesus Christ and our love for one another. With assurance of the Spirit's blessing and guidance, we entrust ourselves to God's purposes. The governing board of a parish in the Episcopal Church is called the vestry. This historic term refers to the group of lay (not ordained) members of the church elected for a three-year term to oversee running the business of the church. The vestry is the legal representative of the parish regarding all matters pertaining to its corporate property. At St. Luke’s, classes or groups of vestry members are elected each year. As a class of members retires, new members are elected for a three-year term. The presiding officer of the vestry is the Rector (priest in charge). The Senior Warden, appointed by the rector, leads the parish between rectors. The Junior Warden has responsibility for church property and building maintenance. St. Luke’s began as a true frontier church. We don’t know any stories about cowboys riding their horses down church aisles or shoot outs down the street, but they may well have happened. Idaho was still a pretty wild place when a group of Episcopal officers began meeting in the 1880’s, most often in their quarters at Coeur d‘Alene’s Fort Sherman. Initial Episcopal services were random gatherings; the first official service appears to have been held in the Odd Fellows Hall, led by a candidate for the priesthood, Fred Sellick, in September, 1891. Accordingly, St. Luke’s is celebrating its 125th anniversary in September of 2016. We believe we are the oldest continuously operating Protestant church in town. Construction of the church building was begun that same fall on donated property and the first service occurred in March of 1892, officiated by The Rev. Herman Page. The current building, at 5th and Wallace in downtown Coeur d’Alene, was expanded in the first decade of the twentieth century and has served this active congregation over all of those years. There have been several additions to the original building and everything has been modernized, of course, but church goers still sense a lot of history whenever they enter the front doors. St. Luke’s has a long and proud history. We are a member of the Episcopal Church, a Protestant denomination that has its origin in the Church of England; the Episcopal Church, in turn, is a member of the Anglican Communion, a worldwide community of Anglicans and Episcopalians. Before the American Revolution, the Episcopal Church was governed by the Church of England; it broke away after the Revolution but remained in communion with the English church and other Anglican churches around the world just as it is today. We invite you to join in celebrating the legacy offered to us by those who have come before, and in forging a new legacy for those to follow. The Episcopal Church is part of the reformed tradition but directly connected with the early Christian church. We are bound together by our belief that the Holy Scriptures contain all things necessary to salvation. We believe that the Bible is the way to know God through Jesus Christ, and that by listening to the stories that connect us to Jesus, we can discover God’s hope in the saving presence of His Son. Read more about the the Episcopal Church. 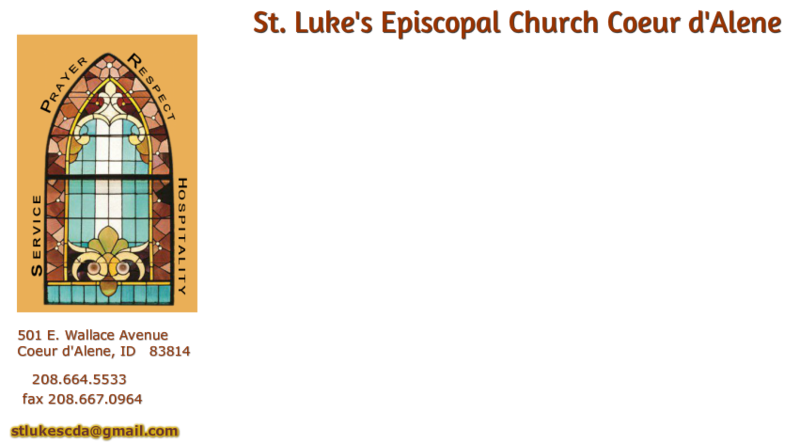 St. Luke's Episcopal Church is a member of the Diocese of Spokane. Camp Cross is a camp/retreat ministry of The Episcopal Diocese of Spokane and is located on Lake Coeur d'Alene near Loff's Bay. For additional information, use the link below.